At AmeriStudent, one of our top priorities is providing the best and safest homestays in the international student industry. But can't any company claim that they're doing the same? What sets AmeriStudent apart from other homestay companies in the industry and how do we maintain integrity and accountability in this area? One way we do this is through our normal processes, procedures, and standards, all of which have been carefully designed to to make our clients' study abroad experiences as safe and fully supported as possible. We carefully interview and vet students and host families, conduct in-home interviews and visits of potential homestay provider, and provide various trainings to equip our students and host families for what they will face over the coming year. We also maintain contact with schools, agents, and native families to ensure that every involved party is updated on a student's progress throughout the year. And most importantly, we offer 24/7/365 support because we know that matching a student and getting them into a good homestay is just the beginning of a 10-month process in which further questions and unforeseen issues will arise, and we are happy to help! But even though AmeriStudent has implemented strong standards to help us stand out from the pack, we also maintain a significant component to our quality assurance in our CSIET accreditation. 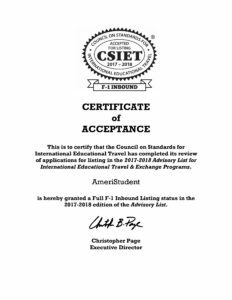 The Council on Standards for International Educational Travel, or CSIET, is a non-profit watchdog organization whose mission is "to provide leadership and support for the exchange and educational communities to ensure that youth are provided with safe and valuable international and cultural exchange experiences. "* CSIET accredited members are required to adhere to a number of strict standards relating to organizational stability, financial integrity, the screening and training of students and host families, and operational procedures. By conforming to these standards and becoming a member organization, a company is saying that they are committed to providing effective and safe arrangements for students and host families in the international student industry. Therefore, AmeriStudent is proud to announce that we have recently received our renewed accreditation with CSIET for the 2017-2018 school year. Our affiliation with this organization reflects our commitments to transparency and accountability, and it helps communicate that we want to do everything we can to provide the safest environments for our clients!